Dougan’s my name, and having fun is my game! Running, romping, tugging on toys, I want to do it all. And don’t think only having 3 legs brings me down, not one bit! I can race around the yard as good as anyone. 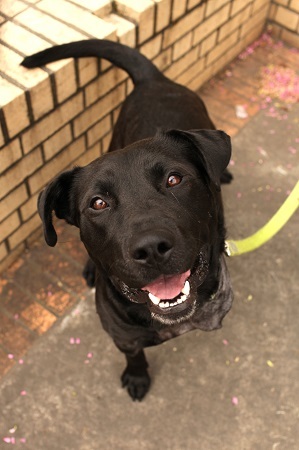 I am a 2 year old Lab Mix, which means along with my love of activity I will also gladly eat your leftover hamburgers and chili cheese dogs. I am very affectionate and have a happy outlook on life. I enjoy the company of other dogs and would do well with kitties (fair warning, I may chase one if it runs really fast, so dog-savvy kitties are best). Do I sound like just the right companion for you? Fill out an application at pixieproject.org so we can schedule a meet and greet. I am fixed, vaccinated and microchipped. My adoption fee is $200.